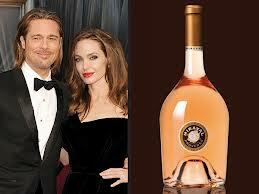 The first wine to be sold from a French vineyard owned by Hollywood couple Brad Pitt and Angelina Jolie will go on offer this week to online buyers with a thirst for celebrity. The first 6,000 bottles of organic “Miraval Rose 2012” will be sold on the Internet on Thursday for $140 a case including shipping to addresses in France. The wine, praised by one wine critic for its “dynamism” and “expressive fruit”, was produced from Grenache, Syrah and Cinsault grapes grown in the scenic Var region of southeastern France on the 40 hectares owned since 2008 by the A-list couple.